I have a special treat for you today – a guest post from Tamra, a San Diego native and long time vegan. Tamra loves great vegan food and is on a constant search to find it. She also plans on attending The Natural Gourmet Institute in the Spring of 2015. Aside from her passion for food, Tamra loves listening to live music, crafting, hiking and backpacking, riding bikes, and taking photos on her 35mm camera. Did I mention she also brews her own beer? Check out her awesome Blind Lady Ale House review below! NORMAL HEIGHTS. As many San Diegans may know, the craft beer movement has been growing rapidly over the last few years. Four years back, Blind Lady Ale House opened its doors and taps to Normal Heights and has never looked back. They offer the best local craft beer and recently their own, paired with artisan pizzas and other treats. On the menu, the vegan and gluten free options are clearly marked welcoming all beer and pizza lovers. The atmosphere is family friendly, yet it retains a certain level of maturity. It’s a beer bar, but it’s a place to enjoy and savor the moment which sets this establishment a cut above anything else in the area. The decor is rustic, and adorned with tons of vintage beer cans and signs from a private collection. Also, you’ll notice the bicycle hanging from the ceiling, Blind Lady Ale House supports San Diego’s bike culture by hosting events and bikes rides for different charities throughout the year. You order your food and drinks at the counter and their pizzas are also easily customizable. Written on a large chalkboard is the expansive beer list. Feel free ask the beertender behind the bar for the perfect pairing with your food. They are happy to help and offer samples to compare your choices. The dining area is comprised of two rooms and plenty of long wooden picnic tables. The community style seating is a great way to get to know your neighbors, or loosen up a bit in the friendly atmosphere. Everyone is here to share the same experience. I ordered the mixed greens salad which comes dressed in a tangy, sherry vinaigrette and tossed with fresh croutons. A great balance of tender baby lettuce and crisp, bitter arugula. A very simple salad yet the flavors excite your taste buds thoroughly. Some friends and I ordered a pitcher of the house brewed (Automatic Brewing) India Pale Ale, which was bold yet had a very smooth finish. I love this IPA; it’s not too overpowering and it goes well with anything. I especially enjoy this style of beer with bold flavored food such as the salad and pizza served here. Next was the vegan pesto pizza. Two words: life changing! It comes standard with pesto, cremini mushrooms, kalamata olives, pickled onions and arugula. I have been ordering this pizza for years but I always add rapini (also known as broccoli rabe) and their incredible house made soy chorizo. It’s always a good time whether with family or friends, and it’s nice to know that most dietary restrictions are accommodated. Check their website for the next special event or beer release night! 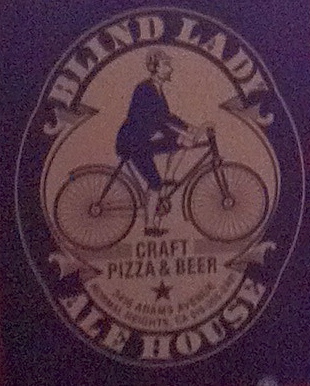 Blind Lady Ale House is located off one of my favorite bike routes on Adams Avenue. Next time you’re in the area stop by for a great time!